Lewis Bennett, a Seneca Indian from the Cattaraugus Reservation, dominated the long-distance racing scene in the mid-19th century. Born in 1830, Bennett ran under the name “Deerfoot,” and achieved amazing feats on both sides of the Atlantic. 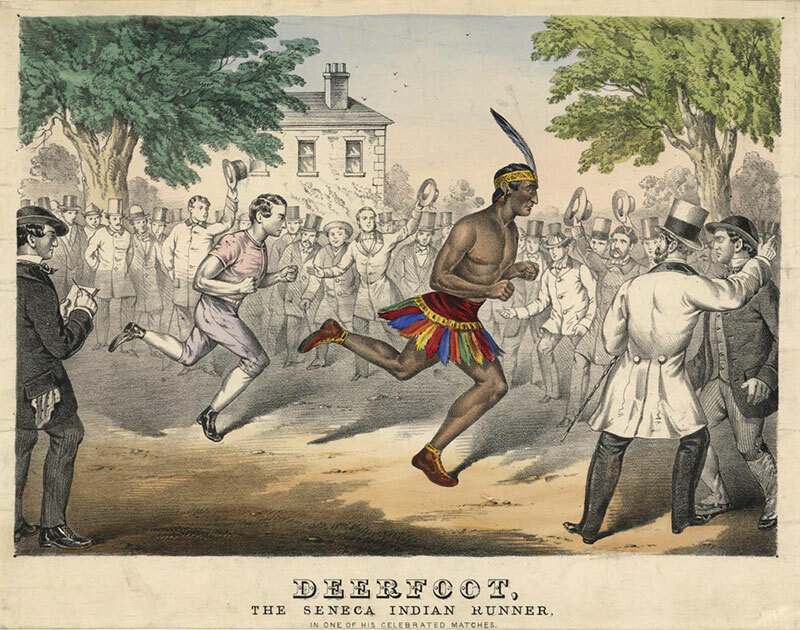 Deerfoot won his first race in 1856 at the Erie County fair, running five miles in 25 minutes. His victory earned him a purse of $50. His reputation spread beyond Western New York, and he raced frequently at fairs all over the Northeast. An English sports promoter heard of Deerfoot and booked him on a 20-month European tour, where he went from mysterious runner, to entertainer, to world record holder. The intense competition against the best British and Irish runners helped him improve dramatically. With the aid of pace makers, he set world records of 10 miles in 51:26 and 12 miles in 1:02:02. Deerfoot’s physical appearance and manners added to his attraction. He stood tall, at almost 6 feet, and weighed 160 pounds. He ran most of his races with a naked chest, wearing a feather apron around his waist and a band with one eagle feather around his head. His dark complexion was a stark contrast to the sun-starved British athletes. He yelled war whoops as he raced to victory. His popularity extended rapidly beyond the racing crowd, and The Prince of Wales attended many races and contributed to the purse. Following his return to America, Deerfoot continued to run locally, limiting his races to Western New York, New York City and Boston. In August 1868, he won a five-mile race in Buffalo in 24:15, despite giving the rest of the field a quarter-mile head start.